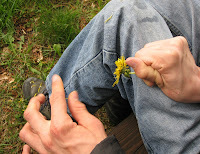 Last weekend I unexpectedly spent a couple of days with my young client in Northern Germany. Not a work visitbut a social one, which was nice for a change. On the Saturday we had the whole day to ourselves, which gave us the opportunity to try out the new Schrittzähler (pedometer) that I had bought for him for his birthday. We were very interested to find out how such a machine would work on the hip of a young man with athetoid cerebral palsy, on a body with lots of movements other than those that would normally be measured by a pedometer. After breakfast we set about reading the manual. I had the English booklet and my client the German version. Between us it took less than half an hour to get it set up, to programme the time, the weight and step length of the user, and to set it up with a German voice! Yes it speaks too! I was impressed with my own technical skills but I was surprised when my young man said that he was too and that until then he had not had much faith in my technical abilities. Now there's confidence for you! I hadn’t been too worried as luckily there are five teenagers in the house who could have rescued us if the technical language had been too much for me! My client was relieved and happy when eventually he had his new machine clasped to his jeans and it began to speak to him. He discovered the time, the temperature, his burn-off of calories, as well as the steps and kilometres that he had walked. What would this pedometer do with all his over-movements? The answer was nothing other than what it should do. It measured the steps forwards but also those backwards, which are often needed to retain balance, but it still worked, measuring only steps and no other movements. So with the breakfast table cleared, pedometer securely fastened on hip, walking boots tied tightly, extra T-shirt on and windcheater fastened to the chin, we were off. Off to the highest, windiest, southerly side of the village. It is part of our usual tramp. Always the first port of call is the graveyard where we admire the flowers and say 'Hello' to the Great Grandmas and Grandpas, the Omas and Opas who lie at rest there. We now know that this first stage is 1000 paces, 0.6 kilometres, from home. From here we continued on through our favourite wooded area, around the eastern side of the village, back down into the valley and up the other side. All this time the Schrittzähler was continuously telling us the time, the temperature, and the distance travelled! I worried that the battery would soon run low but I was thrilled by how motivating it was and how it brought a new dimension to our walks together. 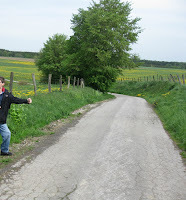 My young client loves the countryside where he lives, often telling me how herlich (beautiful) it is. He asked, as he always does, why he had never come walking here before. He forgets that he couldn’t. It is only since he trained so hard, nearly three years ago, to join in the marching on the weekend of the Schutzenfest, that he can now walk so far. As I have never been here in May before it was probably also the first time that my client has walked these paths in May. 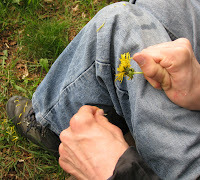 The fresh colours were amazing, especially the yellow dandelions in the bright green meadows. These will soon be mown for fodder for the milking cows, who sadly live indoors. We decided on taking the short cut home as it was nearly lunch-time. After lunch the pedometer was the motivation for a second round and we ended up with ten kilometres on the clock before it was time for me to catch the train home. We had had a lovely day together and we are both thrilled to bits with the success of the pedometer. Especially pleasing is the fact that it has a loudspeaker which makes it much more practical to use. There is also a personal alarm which my client is pleased with as it will give him peace of mind if he is out walking alone. Having seen this weekend how motivating using the pedometer is I am going to invest in another one to use with other clients. It is amazing how quickly the kilometres accumulate, especially just walking around the house and up and down the stairs. It was wonderful to see how motivating this is. In one of the photos above you can see my client, who was taking a rest after walking several kilometres, absently mindedly plucking at the petals of a flower. We don't think about it. We just pick a flower and pull off the petals, sometimes at the same time saying the rhyme "She loves me, she loves me not". Watching my client doing this just as anyone else would do it brought a lump to my throat. I thought about the hours that we have spent over the past eleven years, learning not only to walk, to drink and eat, to speak and sing, but also to pluck the petals from flowers! We have also learnt to rock at rock concerts, swing at parties, cook dinners like on TV, paint for exhibitions and to march the surrounding countryside!